Today after the morning meditations and worship, i felt like working a little on the computer and check out things like cleaning up emails and some other stuffs. I noticed a question in reply to the subscription mail of Shirdi Sai Baba videos blog. To the mail first was a thanks giving reply to the mail sent through subscription. My name is Sergio Gonzalez from Costa Rica. You don't know how I was looking for this song,"
Next today is the question "What's The Meaning of "Om Sai Ram"?" I started writing the reply and thought of posting the reply on this blog. As far as i am aware we should not be looking for the meaning of mantras. We should chant the mantras that we feel we are attracted to. Mantras are chanted to kindle the spiritual energies within us. They make a positive effect on our mind and heart and brings us nearer to soul. So if when we feel a soothing and deep effect, or if we feel the spirit within us is evoked or when the hairs of our body stands on their end, or we feel any of the 8 kind of Spiritual ecstasy, we should repeat that mantra more and more. It is more important to quench our thirst by drinking water than to know more about water. Reading a lot about water, knowing it's chemical formula like H2O will not satisfy the thirst. It is ok if after satisfying our thirst by drinking water we may try to find the meaning of what water is, still drinking of the water is always of more importance than finding it's meaning or gathering much information of the water. 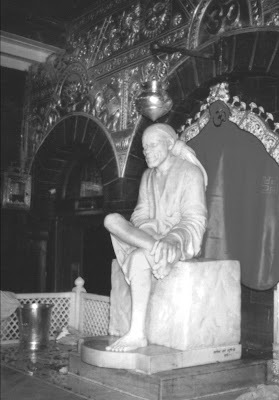 Sai Baba used to ask devotees to do Naam Saptah. Any divine name of God or mantra would be chanted continuously for a week. By this Sai Baba also indicated that the effect of chants gather more spiritual energy when it is being done on continuous basis. The dynamo of the mind should churn more and more chants to create that energy just as a dynamo has to be spin more to create more electric energy. Hence Shraddha and Saburi. We cannot expect to light our house after an hour of dynamo spinning. Now coming to the meaning of Om Sai Ram. Om has been given many meaning yet it is beyond all meanings.The rishis and sages who went deep within their self experienced this sound Aum ॐ and it has great spiritual significance. Again it has to be experienced. We can experience it. Just sit with your body relaxed and straight, mind also relaxed after taking a slow deep breath chant Om, and you will feel the effect it creates on mind and body. Every day if the chant is repeated it reveals it new meanings. Sai is the name of God given to Sai Baba of Shirdi. In Sacred Text Shri Sai SatChritra Chapter 3. In Sai Baba's saying one can note that Sai Baba said that even the chanting of name Sai with Shradha (Faith) will burn away the sins (the sanskaric effect one reaps of hurting other beings) of speech and deeds. Ram. Ram again is a spiritual name with great powers. Many devotees has felt and still feels the power of name Ram (Raam). So this manta Om Sai Ram combines the power of three powerful chants. About the chanting of the mantras one thing comes to my mind what Sri Ramakrishna Paramhamsha said about it. In the book Gospel of Sri Ramakrihsna it is recorded while His talks with one devotee that The chanting of Mantra has great effect and leads one to the God Sat Chit Anand. It bears fruit even if the effects does not show immediately. It is like a seed that will germinate, the tree will grow and bear flowers and fruits. However the effect is more powerful when one has his mind on the mantra and God. The unconscious repetition of the mantra while the mind is engaged in the worldly affairs has little effect. Nice interpretion about the meaning of "Om Sai Ram". Baba has led emphasis on chanting mantras and here this fact is enlightened very aptyly. thanks a lot for every information you give about our dear father SAI.everytime i read your articles im unable to control my tears.so beautifully written.thanks a lot once again. Thanks a lot for such an informative post ! Thank you for sharing this with me. I really enjoyed your miracle. Sai tuim hi tum ho humare paalanhaar ... OM SHRI SAI NAMAHO NAMHA !!! I had a hectic dy at office and in addition to that some dirty politics. I was really disturbed and hence wanted to Talk to Sai.... I just googled "OM SAI RAM" and got this site.. Reading your post has really given me the peace of mind i needed. Thanks. Hope Sai gives me the strength to be strong and not get affected by such petty things and rather concentrate on my work which is more important. rohit ---- om sai namo nam shri sai namo nam jai jai sai namo nam sadguru sai namo nama. Thanks! for posting so nice interpretation, can someone tell me, in which scripture(mainly from 4 vedas) details of mantra is mentioned. Thanks ! for posting so nice interpretations. sai ram is great.he is the god who gives things so quickly.this article is also so good. Om Sai Ram, Bless everyone throughout the world. One and all. Please fill our mind with peace. SAI BABA BLESS US ALL. Sairam something is upsetting me and i am feeling very heavy in my heart ...please help me overcome this bad omen !!! OM SAI RAM. Thank you for sharing the wonderful interpretation with its profound significance. I hope you don't mind my taking the liberty to add my thoughts in this regard and do pardon the evident shortcomings of my intellect in this regard. OM SAI RAM is a complete chant in itself as it is one-pointed devotion to Hari-Guru and Shri Sai, while in his physical form, used to time and again preach the principle of non-duality and with it, always emphasize that guru and god, both reside in the heart and there is absolutely no difference between the two. This potent mantra leads the devotee on the path of realization of this principle. Once again, do pardon the limitations of my intellect.